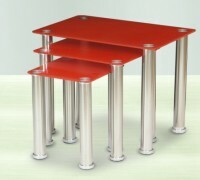 These stunning nested tables with tempered red glass are a great piece of furniture to add a stylish touch to any room. 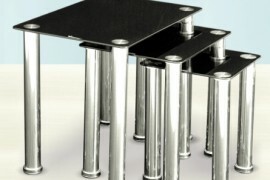 The crystal nest of tables consist of three tables with chrome finished legs. SKU: n/a. Category: Occasional. Tags: coffee table, side tables. 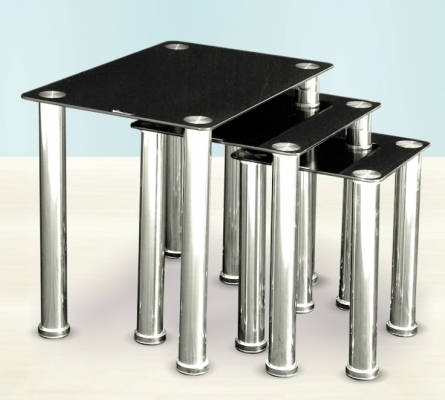 This nest of tables is a stylish mix of Clear Glass with Chrome legs. Comes in 3 different sizes which slots perfectly together. Comes in a pack with three tables together, it sure would add Unique Style to any living room. Also Available in Frosted, white and Black, colour.